Quick and easy installation. Install between two walls instantly without anchors to walls or floor. Simplified, patented pressure lock system. Floor anchors are not required but are available for special installations. Compact, fold-up size and heavy duty swivel casters make moving and storage easy. Electrogalvanized finish. Padlock hasp is standard. 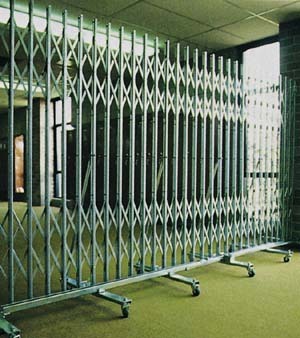 Cylinder locks are available for additional security. 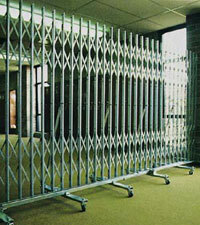 Two or more gates can be joined together for large expanse.